There are only two kinds of girls in this world, the ones who are super organised and strategic in their packing and those would literally never give it a second thought. Yeah, sounds obvious doesn’t it. Perhaps too obvious as we’ve had a couple of people turn up to the Fijian Touch Cup without their boots. Seems too obvious to forget doesn’t it? Double check before you head to the airport that you’ve got your 3G boots and your trainers. Most players find wearing their 3G boots comfy enough in Fiji. If there is a big downfall of rain in the run up to the tournament we’ll email to let you know you need to bring your studs. This one defo applies for the guys as well to be fair. Remember that you’re not allow to wear metal hair grips during the games so bring some extra hair bands or a Buff to tame your mane! Whether you’re taking a dip in the pool for a post-match recovery session or heading out on the free kayaks and paddleboards. You’ll definitely want to make the most of the free snorkelling too. Perhaps you’re not a water baby and just want to chill by the poolside or catch a tan on the beach. Either way you’ll need to pack your swimmers! The ultimate form of rugby stash. Right? Although it’s super hot in Fiji you cool down really quickly once you stop playing. Cooling down too fast can lead to cramp or niggley injury that could take you out of the tournament. Doing a proper cool down after your final match and whipping on the compression tights is a sure fire way to avoid injury and DOMS! Another way to avoid injury, and illness in fact, is to bring along an electrolyte mix and a protein shake powder too. Electrolytes will help hydrate you after the games and help you retain water, dehydration happens slowly and can lead to heat exhaustion and heat stroke…not cool. Rugby girls do like to dress up really! You and your teammates are invited to our welcome evening cocktail party and our end of festival awards evening and party. Although neither of these are black tie formal it’s great to see everyone hit the dance floor in their finery. We’re staying at the 5* Sheraton Fiji resort so why not embrace the high life for a couple of days! Down at the playing grounds we have plenty of water available for players but in a bid to help the environment and reduce plastic we encourage you to bring a reusable water bottle with you. That way you can help keep yourself hydrated throughout the day. 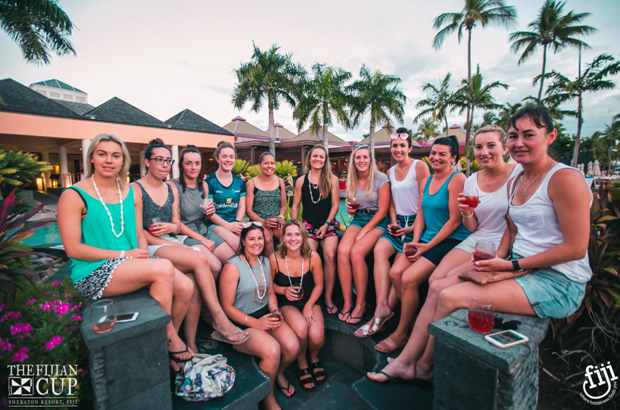 There is SO many food options at the Sheraton Fiji but if you know you need a snack boost between games or at half time we suggest you stock up at home and bring some bits with you to keep you going between meals and between games. Last but not least, don’t forget your passport! Of all things don’t forget your passport! Is your passport in date? Go check now…go!